I'd been wanting to try Safari 4 since the final was released at the WWDC, but I have been stymied on my Intel MacBook by the fact that Safari 4 for Leopard requires the Mac OS X 10.5.7 Update, which I've been reluctant to install due to the extraordinary number of problem reports, especially with laptop computers. However, I did manage to get Safari 4 for OS X 10.4 "Tiger" installed on my old 550 MHz G4 Pismo PowerBook last weekend. Safari 4 for Tiger requires OS X 10.4.11, which I already had installed, and the OS X Security Update 2009-002, which I hadn't, so that involved another updater download. The installations took about 20 minutes cumulatively, including two mandatory reboots on the old PowerBook, and I was good to go. 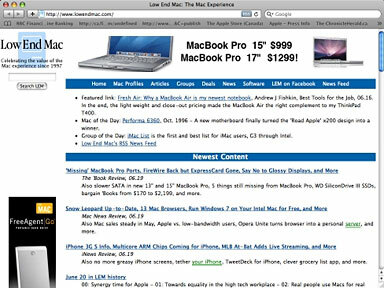 Low End Mac as seen in Safari 4. I've never been much of a fan of Safari's user interface, and I was disappointed that Apple wimped out on shifting tabs up into the title bar, as they did with the Safari 4 public betas. I wasn't in love with having the tabs up there, but it did give the bland, grey Safari visage a bit more character. However, Safari 4's advantages lie elsewhere, in its close integration with the operating system, which I assume helps account for its delightfully quick startup even on an old 550 MHz G4, and its speed, which on my slow rural dial-up connection is second only to Opera 10 with the Turbo feature engaged. While the tabs are back in the conventional place, the other controversial UI change from the Safari 4 betas - namely doing away with the blue progress bar that crept across the address field in earlier Safari versions - has been retained in the final. I have mixed feelings about this. I never really liked the progress bar sharing the address field, which seemed untidy and clumsy to my sense of order and aesthetics, and it never seemed especially accurate either. On the other hand, I do like having a progress bar, which may seem superfluous to folks who have DSL or cable connections, given the speed of today's browsers, but they are far from a trivial matter for the sizable proportion of the world's Internet users who are still stuck with dial-up - or even the slower species of broadband. As Betalogue's Pierre Igot, who (like me) lives in rural Nova Scotia, Canada, where many of us still don't have access to cable or DSL, noted in a recent column, Apple's replacement of the blue progress bar in the address field with a little spinning wheel icon is yet another illustration of Apple's historical disregard for and lack of concern about the needs of users in low-bandwidth situations. For we second-class netizens still treading the donkey-path beside the information superhighway, browser progress bars serve two important functions, the first providing an indication of how much of a Web page has loaded and thus a projection of how long one has still to wait, and the second being a visual, real-time confirmation that anything is happening at all - or not if a page load stalls, which they often do on dialup. This may seem quaint to those who take broadband speed for granted, but I assure you it's anything but with many page-loads measured in minutes (sometimes many minutes) rather than seconds. "Progress" takes on a profoundly different shading, and being informed that it has ceased and further waiting for an automated time out is an exercise in time-wasting futility. This is far from a trivial consideration. With the little spinnywheel thingie and the hopeful accompanying message "Loading", there is no positive indication whether progress is being made or not, since the wheel just keeps on spinning (good metaphor) even if the load stalls until the time-out toggles, and there is no sense of how much longer it's going to take. However, Safari 4's speed does go some way toward mitigating the aggravation, and at least a stop page load button is incorporated in the wheelspinner field - something that was missing in the Safari 4 beta I tested. Nevertheless, I ended up reverting to Safari 3 on the old Pismo for reasons entirely unrelated to version four's browsing performance. As I mentioned, the system requirements demanded the OS X Security Update 2009-002 be applied before installation, which I did. I'm not sure whether the security update or Safari for itself was the culprit, but whichever, I discovered after a couple of hours use when I happened to open the Network System Preferences pane and a dialog sheet popped up informing me that the system settings had been modified by another application - best guess: Safari 4 - and when I attempted to dismiss the sheet, it immediately reappeared in a sort of a whack-a-mole closed loop. I couldn't access any of the preferences controls or, for that matter, even close the network panel. My only recourse turned out to be killing System Preferences with Force Quit. I was still able to dial up to the Internet using Internet Connect, but I couldn't change its or other network settings - obviously not a tolerable state of affairs for the machine that I use as my road computer for logging onto WiFi networks and such. I tried running a full slate of system maintenance routines - Repair Permissions, cron scripts, cache dumps, using OnyX - but no joy. Next I tried the more drastic approach of trashing Safari 4 and everything associated, such as preferences files (I did salvage the bookmarks plist), but still the same behavior in system preferences. The problem may well have been the security update itself having some incompatibility with my setup, but there was no way to determine that. I eventually rectified the situation by booting into Mac OS 9, which I have installed on another partition on the Pismo's hard drive, trashing the OS X 10.4.11 system file, and then reinstalling Tiger from the install DVD. I also had the OS X 10.4.0 combo updater installer and the OS 10.4 .11 incremental "Delta" update installer, so I ran them as well. That was how I spent much of my Saturday afternoon, ending up essentially where I had begun in the morning prior to installing the security update and Safari 4. Needless to say, I did not reinstall the security update, so it appears that running Safari 4 on the old machine is not an option either. I will eventually install Safari 4 on my MacBook, but probably not until after Apple releases a 10.5.8 update to fix the bugs affecting 10.5.7. Anyway, back to a bit more about Safari 4. One of its marquee features borrowed from (or at least inspired by) Opera's Speed Dial feature, is Top Sites, which provide an at-a-glance preview of your favorite websites when you open a new tab or browser window. Opera has had Speed Dial for several years now, but Safari 4 takes the basic idea and runs with it, not only creating thumbnail links for favorite sites, but tracking the sites you browse and ranking your favorites, presenting up to 24 thumbnails on a single preview page. 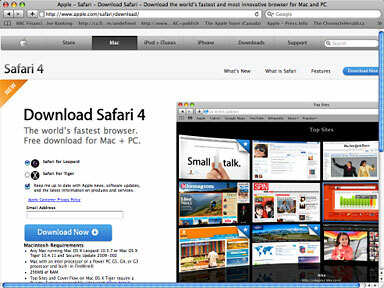 Top Sites in Safari 4. Wondering which sites have changed since your last visit? Sites with a star in the upper-right corner have new content. A single click opens the page and updates its thumbnail. Whenever you want to return to your ever-evolving Top Sites page, just click the new Top Sites button in the bookmarks bar. Top Sites is significantly more attractive - stunning really - compared with Speed Dial's looks, although you can skin Speed Dial. I digress. Full History Search in Safari 4. More Safari 4 features include Full History Search, with which you can search through titles, web addresses, and the complete text of recently viewed pages (just type a word or phrase in the History Search field in Top Sites, and Safari quickly presents you with a list of possibilities). You can search for anything that was on a page previously visited, even photo captions. 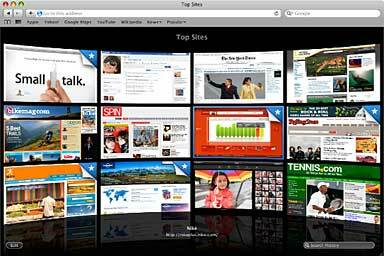 Cover Flow in Safari 4. Then there's Cover Flow, which lets you flip through Web history or bookmarks; Full Page Zoom, which lets you take a closer look at any website without degrading the quality of the site's layout and text (Opera's implementation of this is slicker and more convenient); and built-in Web developer tools to debug, tweak, and optimize a website for peak performance and compatibility. Well, not over my dialup connection, where I would seat-of-the-pants rate Safari 4 as a bit faster than non-turbo Opera and Firefox - but not by much. Broadband may be a different story. Unfortunately, Safari's Download Manager is still lame compared with the excellent one in Opera, which is IMHO state of the art in browser download managers by a wide margin over everything else. It's all academic to me at this point, since I no longer have it installed on any of my computers. I'm finding it no hardship with Opera 10, Firefox 3.5, Camino, and iCab all giving me great service. As for system requirements, Safari 4 for Mac requires either OS X Leopard v10.5.7 or OS X Tiger v10.4.11 - the latter updated with Security Update 2009-002, a minimum 256 MB of memory and is designed to run on any Intel-based Mac or a Mac with a PowerPC G5, G4, or G3 processor and built-in FireWire.